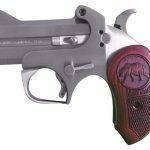 The newest California-legal derringers, the Big Bear and Brown Bear from Bond Arms, bring .45 Colt firepower to the West Coast! New from Bond Arms is a pair of California-legal derringers ready for action. 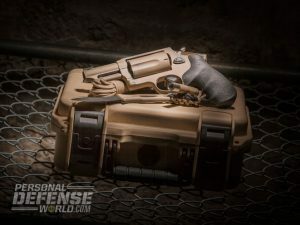 Retooled versions of the company’s USA Defender, the Big Bear and Brown Bear models are the first-ever available Bond Arms guns for the California market. Both derringers are chambered for .45 Colt and are priced at $524, which includes a holster. The Big Bear and the Brown Bear derringers are designed to offer voluminous stopping power in portable, easy-to-conceal packages. While both models are similar in design, they have their own distinct characteristics. The Big Bear sports a black rubber grip with a bear image as well as a galvanized gray barrel assembly. 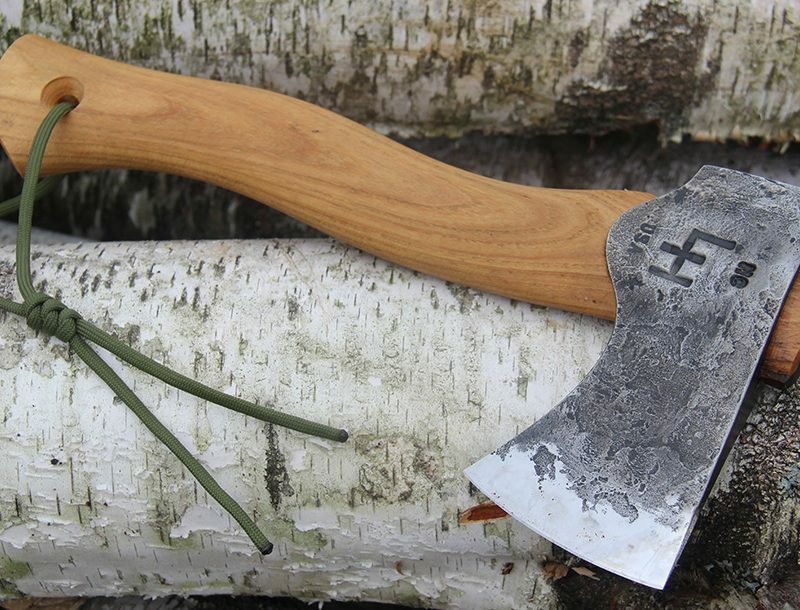 The Brown Bear sports an engraved California bear on the wooden grip. Both models have easy-to-reach hammer spurs that offer a solid purchase for thumb-cocking. 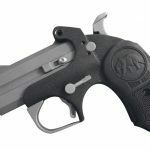 Bond Arms is currently working to get approval in California for the company’s signature interchangeable barrels, which would make either gun even more of a great investment. 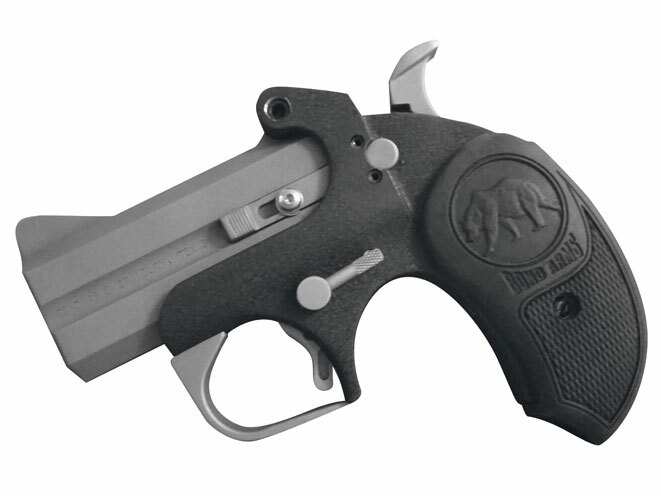 Bond Arms is a recognized leader in the derringer market. 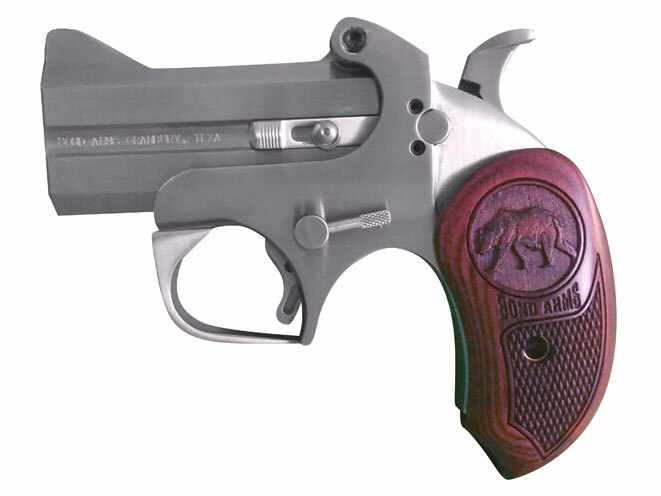 Originally organized under the name Texas Armory, the company became incorporated as Bond Arms in 1995 with the idea that the Remington Model 95 over/under, single-action derringer could be converted from an Old West anachronism into a modern defensive handgun. The barrel and frame were redesigned to safely fire modern calibers. The beefed-up double barrels and frames are constructed completely from stainless steel, and shaped with modern manufacturing processes. If you live in California and are looking for an ultra-compact, easy-to-conceal self-defense handgun, you should definitely check out the new Big Bear and Brown Bear from Bond Arms.